There is one key tip about the best way to enjoy a cruise holiday with kids, and it’s a secret that seasoned family cruise-goers know very well: Have fun, because the worry and stress that comes with so many holidays with the children in tow simply does not exist here! The planning has been done for you; you are safely in one secure place; and you can concentrate on ensuring both you, and the young ones, have a trip to remember. 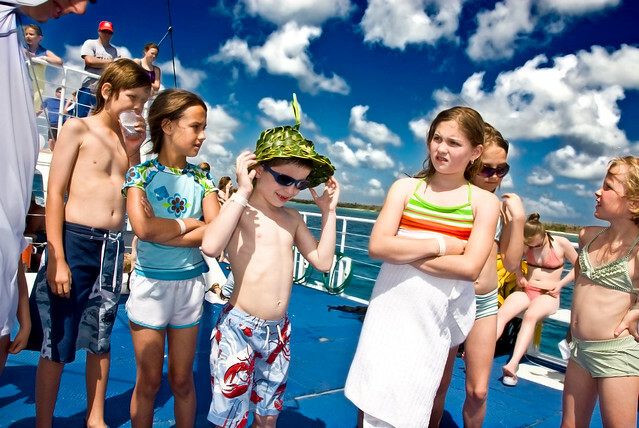 However, there are plenty of tips to make the cruise go with a swing, and the on-board kids club is an important place to begin. Make sure your children are enrolled in one of these magnificently organised clubs, whose sole aim is to look after the youngsters in fine style. These clubs offer games, movies, events and activities, all organised and run by caring and qualified staff. In my experience, Royal Caribbean Cruises are a perfect exponent of this art, which is trickier and more skilful than it looks. If your kids are anything like mine, they’ll remember the club as the best part of the cruise – and that’s saying something. Kids clubs exist for all age groups, from babies and tots, right up to the older teens, all styled for their differing needs, and not lumping all under-18s together in one unholy mess like certain hotels tend to do. Children’s health, is, of course paramount on a cruise, as at home. Make sure you pack travel sickness pills, or the colourful and effective wrist bands which can magically ward off any upset tummies on board, and look cool into the bargain. Get more in-depth information on children’s health while travelling here. When it comes to packing, the kids won’t need to take much of their own entertainment with them. I’m thinking computer games, laptops and the like, because there always so much exciting stuff going on. However, a few favourite toys and a well loved teddy are always a good move. I blamed my son’s teddy for snaffling the free chocolate on the pillow that our steward placed there after making up the bed every day, but I wouldn’t use that as a top tip! If you simply want to enjoy some time with the children, then there are plenty of options. Simply exploring the ship is fun, and you can dolphin watch or count the number of ships you can see on the horizon. Safety is paramount on board ship, so guard rails are well-above waist-height for an adult – more than enough for little ones. Kids and cruises go together like sunshine and fun, but one last tip: make sure they’re on best behaviour in the on-ship environment. Some of the more elderly passengers may have forgotten what it’s like to be a kid, and a smile and a bit of politeness will be hugely appreciated, and engender a happy holiday experience for everyone on board.